Competition over land and the resources found on land drives much conflict around the world. 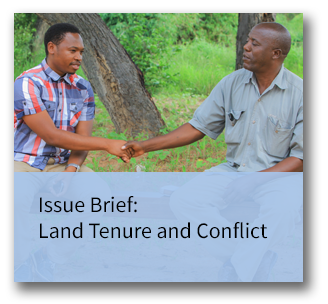 Conflict over land is far more likely to escalate and become violent when land tenure and resource rights are weak, insecure, and non-negotiable and when the land governance systems in place are ineffective, corrupt, or otherwise dysfunctional. When governments and communities successfully prevent or manage disputes over land and resources, they avoid staggering human and economic costs. Because secure property rights play such a critical role in both economic growth and conflict, the tools that can reduce potentials for conflict include are often the same as those that support economic growth and development, such as reforming the legal and regulatory framework, providing reliable records of land rights, and strengthening rule of law through effective dispute resolution. Efforts to protect land and property records, to mediate disputes between and among displaced persons and settlers, and to build capacity in governance systems can help reduce tension and set the stage for productive investments and growth, which, in turn, can decrease conflict.